The NUS Democratic Procedures Committee's (DPC) proposals for 'strengthening NUS democracy' was released last month and contains a number of proposals which will see increased accountability and democracy within the organisation. It will be presented and voted on at the NUS annual conference in April. One proposal is to "make students’ unions’ delegates’ voting records public in order to increase the accountability of these representatives". This was an issue NUS presidential candidate Tom Harwood has mentioned in his campaign manifesto, and something that has come up within the NUS previously. The NUS also plans to create seven regional groups of Student Unions in England. There would also be regional conferences organised to "agree policy that is specific to England". As well as this the conferences "elect a Welfare Officer, FE and HE Officer to be accountable for leading on and delivering policy demands." To make the NUS more inclusive, they plan to ditch some of the 'jargon' and acronyms used in order to make the democratic process more accessible. For example, they would change the word "motions" to "proposals". Other plans include replacing the "conference chair with a neutral student who is recruited by the DPC and trained to facilitate the debate in an inclusive and impartial manner". There will also be a post-conference ballot where 'members' (student unions are members of the NUS, not individual students or delegates) will be able to vote on which policies passed at the conference to prioritise. Another proposal is, in an attempt to 'modernise' the process, allowing delegates to be able to vote online during the conference. Despite 23 proposals to improve democracy within the organisation, the committee has overlooked the One Student One Vote 'OSOV' idea. 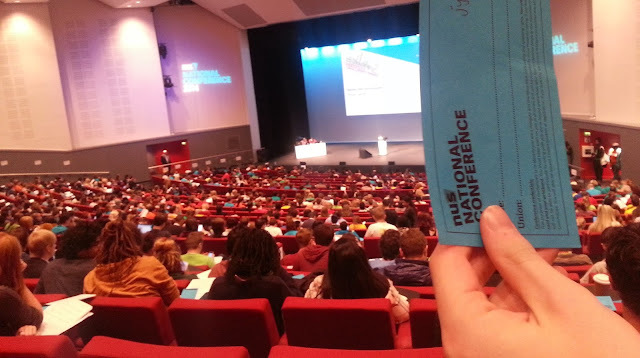 Currently, student unions send delegates who vote on policy motions and elect NUS officers during the conference. For the past five years, the University of York has attempted to pass a OSOV or OMOV (one member one vote) motion, but the conferences has rejected it every time. York's delegates will submit an OSOV motion again in 2017. You can read the fill list of democracy-related policy proposals from the DPC here.